As was promised, the sign-up process has begun for the Pre-OBT. You can sign up here. Help! 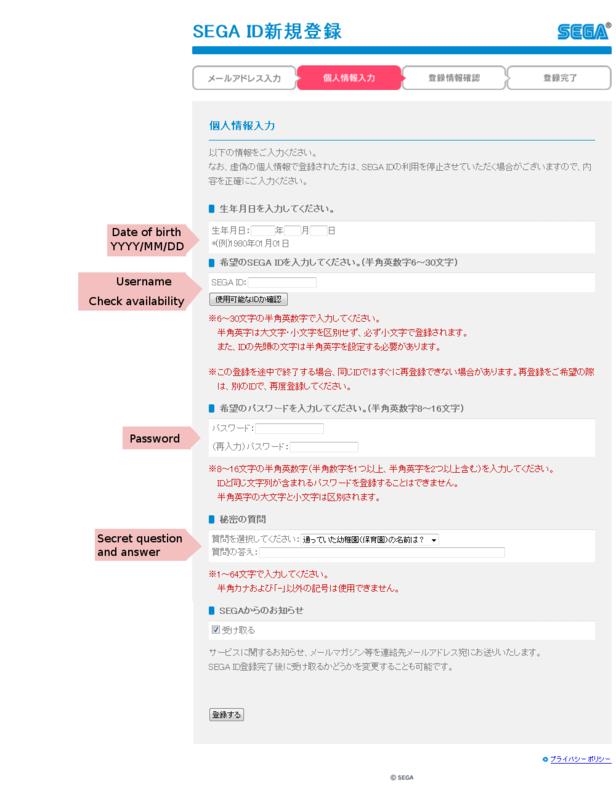 I can’t use the website because it says a Japanese browser is required! 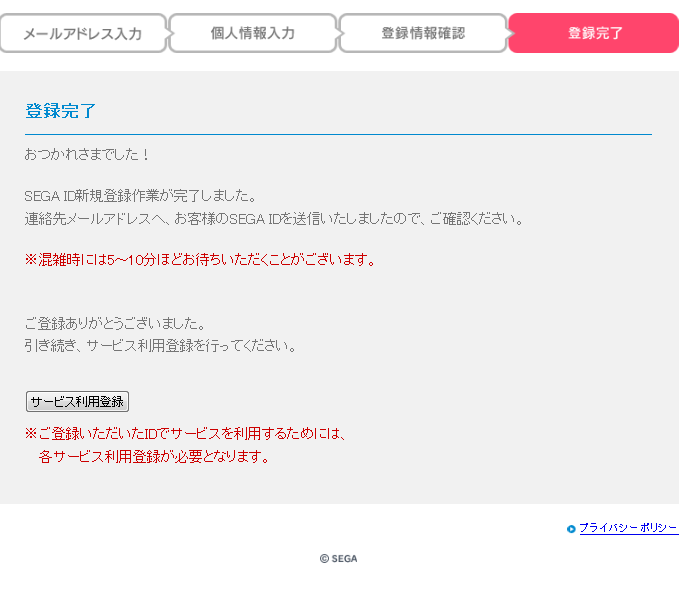 Even if you have Japanese text support installed you may have issues viewing the sign-up page. You can resolve this by going to Firefox -> Options -> Options -> Content -> Choose Language -> Add Japanese using the dropdown menu. You’ll need to click the big blue button first, which will take you to the SEGA ID site. On that page, enter your email address. Check your inbox for an email from SEGA ID and click the first link inside it to continue registration. It should be something like https://iway.isao.net/sega/mail_sr.cgi? etc. On the page this link takes you to, enter your birthdate, going year, month and day. The month and day fields must be 2 digits, so “1” would be “01”. In the field below that, enter your desired username and then click the button below it. This button will check to see if your username is taken or not, it will turn red if it’s taken. Below that is your password. Type it in each of the two fields. Finally at the bottom you’ll see a drop-down menu. This is the secret question and answer part. Unless you can speak Japanese, the choice really doesn’t matter. Best thing I could say would be to screenshot the entry so you can compare if you need to later. Enter your secret answer in the field below the drop-down menu. Then click the button at the bottom of the page to continue. If all went well you’ll now be on a screen that will present your details to you. If it all looks good then click the first button below your details to continue. You’re done registering your SEGA ID. Look at you. Now if you’re on the above screen click the only grey button there to continue. This will take you to the OEMProductMenu.php page. This is where you can sign up to many services, but the only one we’re interested in this time is “ファンタシースターオンライン2“. Click the button below that. Clicking it will take you to the above page, which is just the Terms and Conditions. Click the first button to agree. When you see this, you’re done! Update: What if I already have an account? Adding this to the post as well. If you already have a Sega ID, you’ll need to log in here. 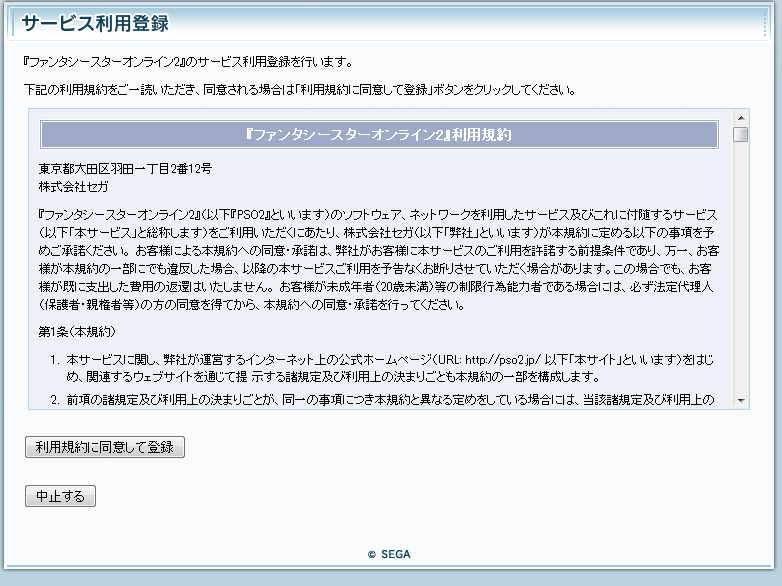 You’ll have to solve a Japanese capcha, use this tool if you can’t read Katakana or don’t have Japanese IME installed. Once you’re logged in, scroll down to “ファンタシースターオンライン2” and click the button below it. If instead of a button you see text that says “サービス利用登録済”, then you are already signed up and there’s nothing else you need to do. If you’ve signed up to previous tests, you may not need to do this again. If you participated in previous tests you definitely don’t need to sign up again. Sign-ups are free, however, so if you’re paranoid there is no harm in just creating another account. The pre-OBT tests are scheduled to take place in late June. The pre-OBT data will not carry across into the OBT. While not unreasonable, it’s still a little disappointing. I’ll probably not bother getting my character to cap this time, entirely dependant on prizes or available content I guess. OBT data is still set to carry through to the release. The OBT will happen soon after the pre-OBT if all goes well. The contents of the pre-OBT are to be discussed at a later date. Keep your CBT client if you still have it installed. You will be able to use it in the upcoming tests. Say, what do you have to do if you want to register for that pre-OB while you already have an account? Just wondering (considering I can’t actually find a link for it anywhere. I’ve been searching around on the net for a while as well without a positive result). Anyhow, thanks for all the updates, I really appreciate it. Ahh yeah.. if you already have a sega ID you can use this link to log in. You’ll need to solve a Japanese capcha, if you can’t read Japanese or don’t have Japanese keyboard input then you can use this tool here. When you’ve logged in you’ll see that list of services, look for “ファンタシースターオンライン2” and click the button below. If it displays the text “サービス利用登録済 ” underneath it, then you’re already in and there’s nothing else you need to do. Pingback: Gadgex – Phantasy Star Online 2: Pre-Open Beta Registration Open! When i start game the 3 bars pops up and i c it downloading but when it gets to 50% it says some kind of error 103 in japanese so please if anyone knows how to fix this let me know ASAP.